A multitude of interesting wildlife encounters awaits guests on a Limpopo holiday at Moholoholo Nature Reserve and Wildlife Rehabilitation Centre. Moholoholo Nature Reserve is great for weddings, safaris, game viewing excursions and discovering top attractions in this popular region on a Limpopo holiday. The Wildlife Rehab Centre offers tours of the facility and unforgettable insights into animal conservation. The centre provides a home for many of South Africa’s abandoned poisoned, injured and abandoned wildlife and is a highly regarded contributor to wildlife conservation. Tours of the centre stimulate awareness and understanding in an informative walkabout. Guests could see Lion, Leopard, Cheetah, Hyena, Serval and Honey Badger, Eagles, Vultures and any baby animals in the centre at the time. Each tour is about 2 – 2.5 hours and takes place twice daily Monday to Saturday. A Sunday afternoon tour is only available in Limpopo school holidays and on long weekends. School tours are available by arrangement. The Centre runs a popular Student Programme for up to 12 week stays. There is also a Basic Game Farm Management & Ranger Guide Course and a Moholoholo Tracking Course. Forest Camp and Mountain View offer game drives and bush walks, with Blyde River rafting and other activities on request. Ya Mati offers a lovely restaurant and lawned tea garden as well as a superb South African bush wedding venue. Birding enthusiasts can set about spotting over 300 bird species in the reserve. Guests can say “I do” in the beautiful rock and thatch chapel and enjoy a much dreamt of South African bush wedding with family and friends. Photographic opportunities can be arranged with a Cheetah or Eagle from the Wildlife Centre. WeddingAttrs of up to 160 can be held in the marquee tent and up to 100 people in the modern restaurant. 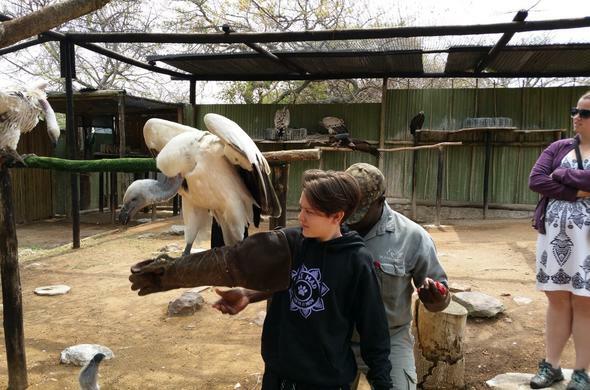 Bombyx Mori Silk Farm, Khamai Reptile Park, Hoedspruit Endangered Species Centre, Echo caves and Kruger National Park. Guests can also enjoy the Panoramic Route (Blyde River Canyon, Bourkes’s Luck Potholes, Pilgrim’s Rest, Graskop and Sabie) which is known for beautiful waterfalls, views, history and shops. Enjoy a wonderful safari wedding at this Limpopo nature reserve in South Africa. A honeymoon chalet is available for the bridal couple. Go on game drives and explore Moholoholo Nature Reserve. Take part in voluntary programmers or courses. School classes can book educational tours.